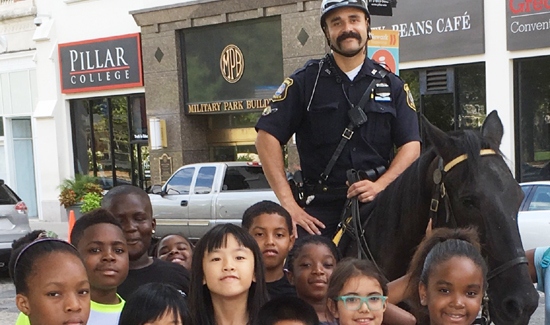 Like Boston and New York City, the Newark, New Jersey Mounted Unit began modestly with one single purpose – to deter crime with a more dramatic police presence and ensure the horses’ future in our community. Across the country, budget cuts have adversely impacted some of our nation’s finest police mounted units. This led us to make an ongoing effort to tell the story and educate the community and the politicians about the great value police horses provide to law enforcement. This way if we do experience budget cuts in the future, our horses will be considered too valuable and popular by our citizens and they will continue their valuable work. “What we are doing is shining a bright light on the great work of the unit,” says Lt. Chris Gialanella. Like most mounted units of the era, the Newark Police Department acquired its first police horse through a farm purchase. No one had an inkling about the horse’s capability, adaptability or how it would perform in an urban environment. But through sheer determination and indefatigable resolve, Officer Theodore Bauer – the first recorded mounted officer in the City of Newark – was able to transform a farm horse into a well-trained police mount back in 1891. That was a long time ago, but Officer Bauer’s mission and tradition of expert horsemanship lives on. The unit was born during Benjamin Harrison’s presidency back in the late 1800’s. Over the years the Newark police horses gradually evolved from a visible presence to a versatile and essential tool utilized for a variety of law enforcement work. We found that in today’s environment, where many vocal citizens are particularly critical of law enforcement, a police horse serves as an ambassador between the police and the community. Officer Raphael Rosa is a 17 year veteran and the author of this article. He has been with the unit since 2004 and is a man who clearly loves his work. A routine day in the life of a mounted police officer and his or her four-legged partner can involve crowd control, traffic enforcement, community policing, quelling civil disturbances, and appearing at school presentations, outdoor festivals and parades. The most challenging time for the unit was during the 1967 Newark riots. The challenges have continued right into the first months of 2018. Over the last 100 years, Newark Police horses have come in all different shapes, colors, sizes and breeds. Most were thoroughbreds. Although considered fine and elegant horses, thoroughbreds were known to exhibit a propensity for running and nervous behavior, an obvious drawback for police work and crowd control. Officer Steve Grosso was a popular mounted unit cop. He’s now assigned to the department’s motorcycle squad. As a result, the Newark Police Department began to integrate quarter horses into its equine fleet. Strong and durable, the quarter horses were reliable, but also responded quickly to fear. 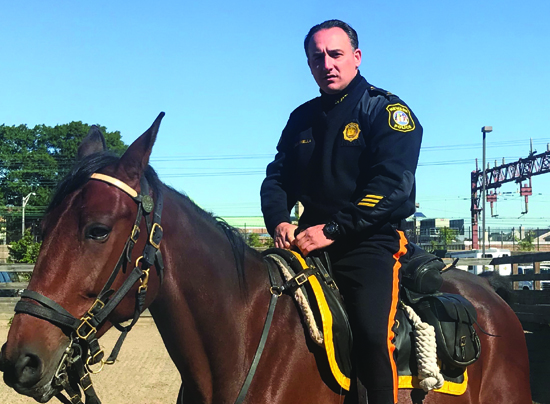 In 2010, the Newark Police Department converted to Standardbreds – a resilient breed tempered enough to deal with the hustle-and-bustle of the city and gentle enough to interact agreeably with the public. It is these retired harnessed horses who presently display courage and equanimity in their new role as sentinels of the city. Along with their human partners, these horses have apprehended robbers, carjackers, theft suspects and drug offenders. These horses also capture the hearts of those people who appreciate their unswerving loyalty and commitment to service. Standing eight feet tall, the mounted officer is a visible fixture above the bustle of the city. To many onlookers, there is nothing more assuring than a patrol officer on horseback. In fact, the officers’ presence serves a dual purpose. On one hand it deters crime. On the other it invites inquisitive onlookers to interact with the officers. Officers on horses brings the best of the past with the present. The horse’s presence revives memories of the city’s not-so-distant past among our older citizens. In his book, The Lexus and the Olive Tree, author Thomas Freedman explains how technology has changed the world. Friedman believes that technological advancement, like a newly minted Lexus, brings us happiness, convenience and luxury, but the olive tree – similar to the tree of life, connects us to what we really cherish and love – the roots and history of our existence. If your agency is undertaking a similar project to get the word out about special units that could be threatened with budget cuts, contact Lieutenant Christopher Gialanella at gialanellac@ci.newark.nj.us. 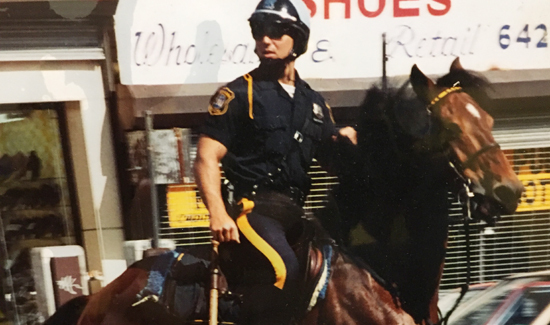 Officer Rafael Rosa is a 17 year veteran of the Newark PD and has been with the Mounted Unit since 2004.